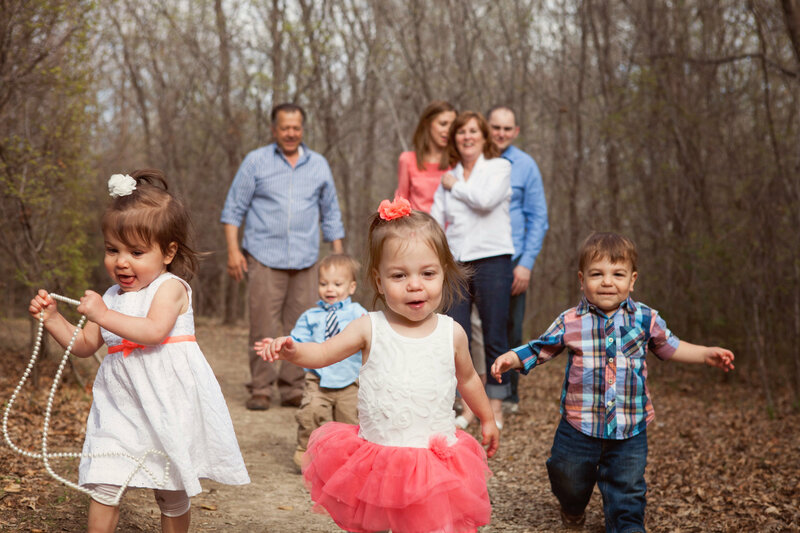 Having high order multiples, or even just a large family, poses certain challenges. One of those challenges is with extracurricular activities, especially for toddlers and preschoolers- think budgeting, class times, transportation, supplies, ect. When the kids were babies, and then toddlers, swimming lessons were out of the question. It would’ve been impossible to attend “Mommy and Me” classes with one Mommy and four babies. 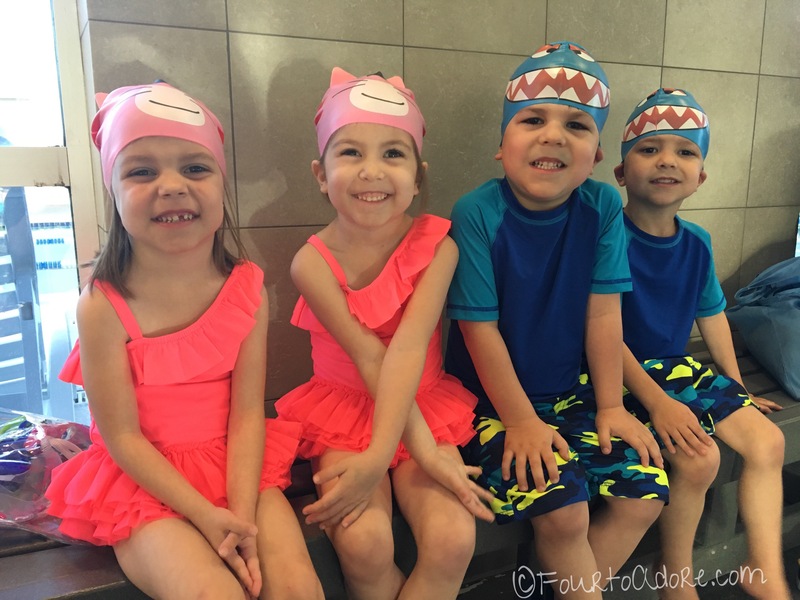 By age three, the kids were eligible for group swimming lessons, but it seemed daunting, and I didn’t believe they’d generalize skills from one year to the next. Now that the kids are nearly five years old, and headed to kindergarten in the fall, I decided it was time. I began researching local swim schools. I poured over pricing, class times, student teacher ratio, and location. Once I determined the swim school, I had to contend with the enrollment process. With swimming lessons, the maximum class size is typically four students, meaning our kids would comprise an ENTIRE class. On one hand, this was great news because our family basically got a private class, but it also meant securing such a class. I contacted the owner of our chosen swim school about our crew. He was able to create a class for us, but we had two wait two months for it to open, and it was in the evening. We didn’t mind the wait since there was a small multiple student discount, and our kids could be in one class. In order to hype the kids up about their upcoming lessons, we went shopping for supplies, which included swim suits, swim caps, and goggles. The swim suits were an easy sell, but swim caps and goggles were a bit more challenging. Thankfully, we found adorable kitten and shark swim caps and goggles in the kids’ favorite colors. When the big day arrived for the first lesson, the kids were stoked and got dressed nearly two hours early. Before class, they watched other kids taking lessons and eagerly awaited their turn. At the start of class, the instructors called each of our kids by name. Much to my surprise, they immediately reported for class and hopped right in the water. Despite a history of fearing water and screaming over being splashed, they quickly warmed up to the class and instructors. 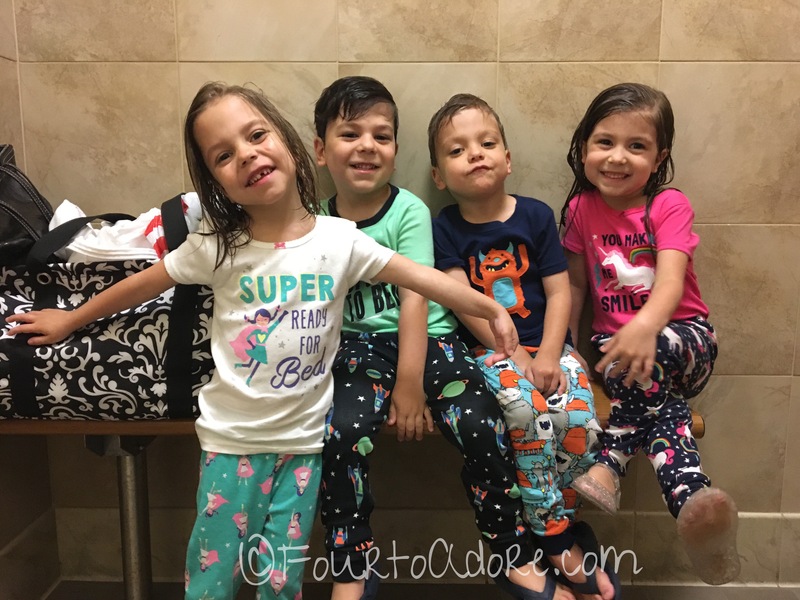 Because the class is in the evening, we discovered it was best to shower the kids at the gym and dress them in pajamas. Then, they have a snack on the way home. This allows them to brush teeth and get to bed on time, which is a huge win! Last spring the boys played tee ball for the first time with i9 Sports. Overall it was a good experience, but I didn’t know if they’d want to play again and I wasn’t going to force it. After all, their first attempt was primarily for exposure to team sports. Sometime in the fall, both boys started asking when they could play again. Technically there is a fall tee ball season, but in Texas it’s about 200 degrees outside until November and that’s too HOT. I promised them spring tee ball. Much to the boys’ delight, the spring tee ball season started a couple of weeks ago. Expecting more dandelion picking and snack munching, I was floored by the boys’ growth. So far, they’ve stayed with the team, followed the coach’s directions, and paid attention to the entire game. Folks, these guys are actually playing baseball!!! Don’t get me wrong, they still need plenty of parental support, but they are far more independent than the toddlers who tried tee ball last year. They have cleats this year, which they believe help them “run fast!!!”. Mason won the medal for “Positive Attitude” last week. 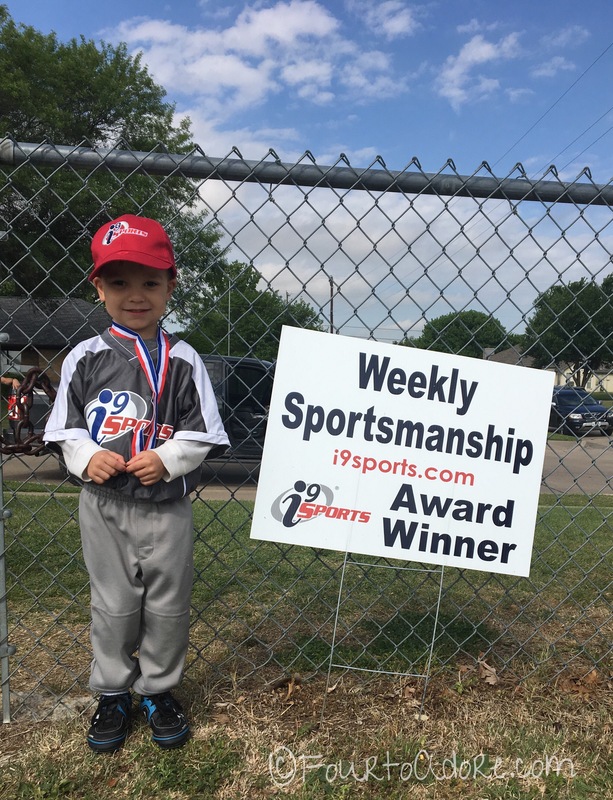 After striking out numerous times he continued to persevere until he made contact with the ball and ran the bases independently. This mama could not have been more proud of him. Each week, I notice more progress and it makes my heart beam. but there is no excuse for anyone to work harder than you do. When the quads were infants, George’s cousin and his wife came to visit from Missouri. Unfortunately, we hadn’t seen them in person since. Life with quads was busy, and they too found themselves busy with life. A seven hour road trip with four babies never sounded like a good idea. After our first successful road trip last summer, we decided to take the quads on a spring break road trip- to Missouri. They were ecstatic! For weeks they asked when we were going to Missouri, and what states they’d see en route (primarily Oklahoma, and a step into Kansas). On our way through Oklahoma we decided to skip familiar fast food chains for lunch in favor of something local. 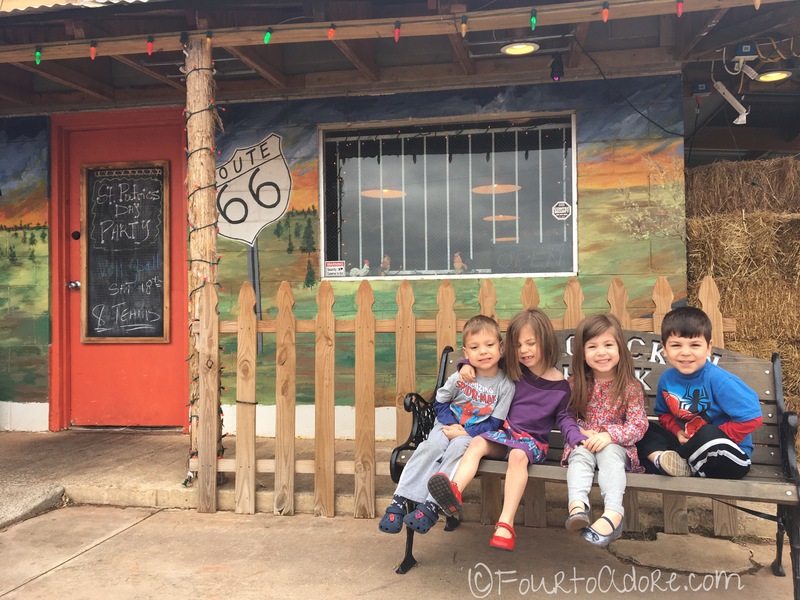 Siri didn’t steer us wrong when she suggested The Chicken Shack off Route 66 in Luther, Oklahoma. Everything was made to order and delicious. The kids thought it was fun driving along Route 66 like Lightening McQueen too. The kids traveled really well, but were thrilled when we reached our destination and they got to meet their cousins. Being the “Show Me State”, Missouri boasts numerous scenic, natural activities. 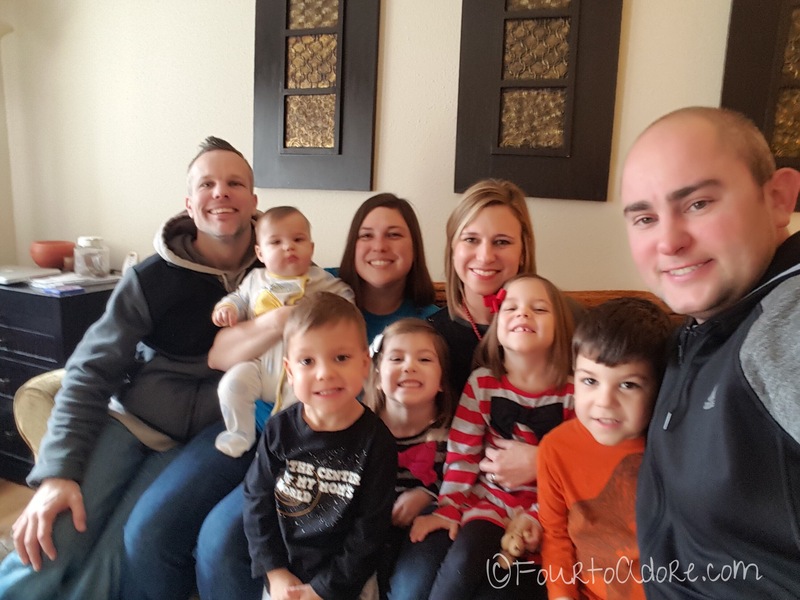 We planned on exploring the great outdoors and taking the kids on a hike through the Ozarks (their first time in the mountains). The weather ended up being less than ideal for anything outdoors, especially for Texans who didn’t pack adequate winter attire. The temperature was below freezing and it snowed enough to keep us inside, but not enough for snow play. Besides enjoying the company of our cousins, we found plenty to do in Springfield. Okay, we didn’t get out of the car for this one because it was freezing and snowing, but the kids got a kick out of seeing the World’s Largest Fork. It’s an impressive 35 feet tall and 11 tons! 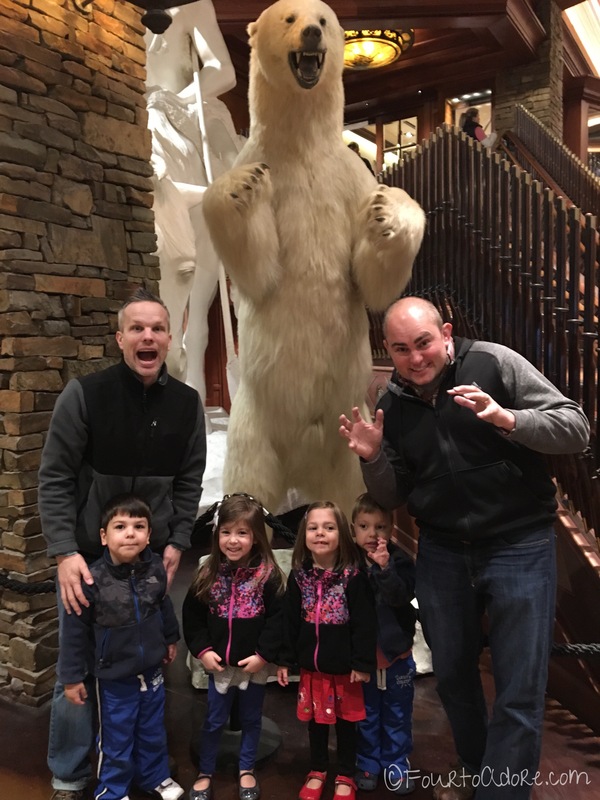 Admittedly, I was not excited about visiting the Bass Pro shops since we have them in Texas, and I’ve been. I learned, however, that Springfield is home to the original Bass Pro Shop and is known as the “Granddaddy” of them. 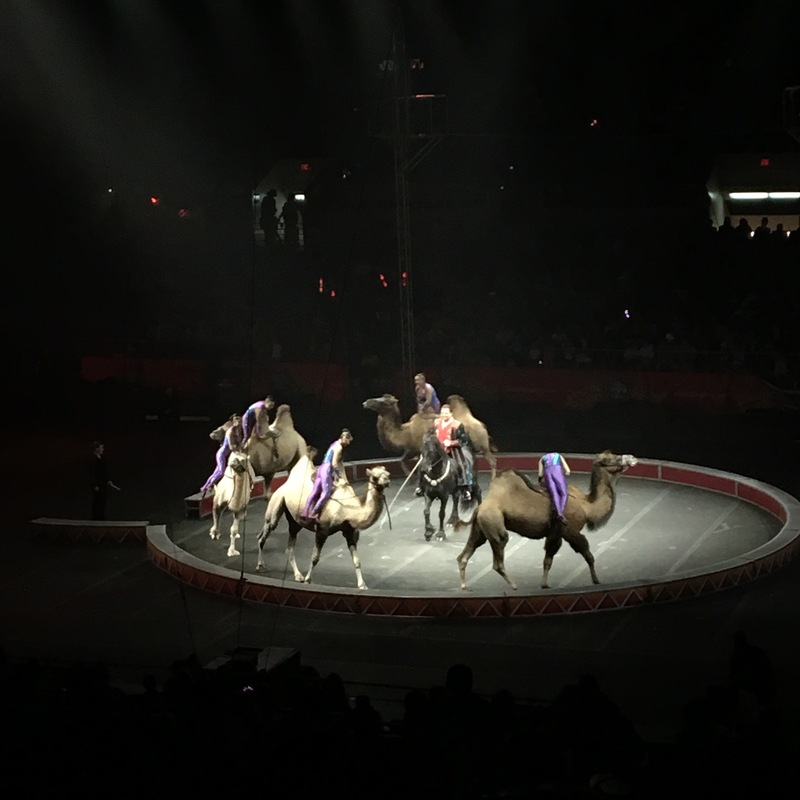 It is notably larger than the others and includes numerous family-friendly wildlife attractions, shows, museums, and other activities. Even if you’ve seen a Bass Pro Shop elsewhere, it’s worth stopping by the Springfield store. Best of all- it’s FREE! The Discovery Center was the highlight of Missouri for the kids. We were able to use our museum passes from home for free admission with to the ASTC travel passport program. 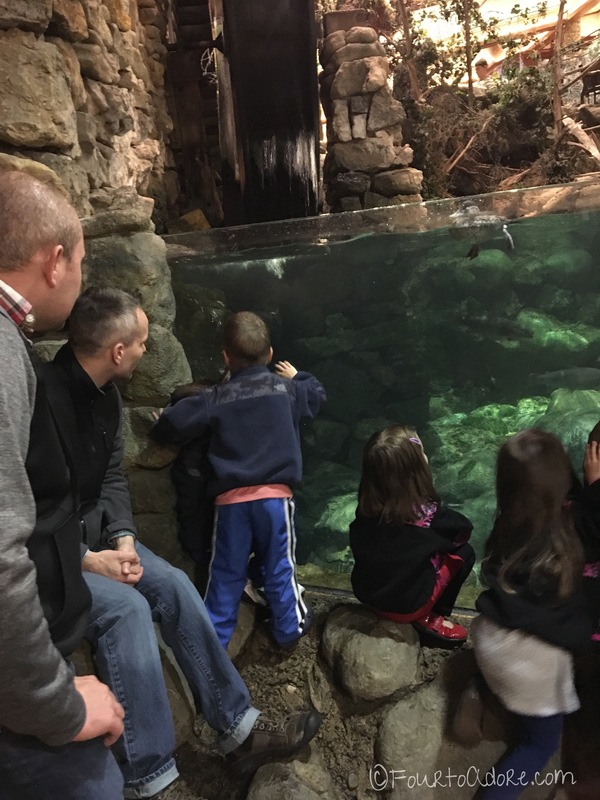 At the Discovery Center, the kids enjoyed exploring numerous hands-on activities and learning about the five senses with larger than life displays. Lambert’s isn’t just a restaurant, it’s an experience. Due to it’s popularity, the wait time for a table is usually at least an hour, but it’s worthwhile! Lambert’s serves up southern comfort food with family style sides. They are best known for their scrumptious warm rolls, which aren’t handed to you. They are thrown! That’s right, if you want a roll with your dinner, you’ll have to catch it, or hope someone will share with you. Harper attempted catching a roll with his t-ball skills, but discovered it was a tad hot for him. The Missouri landscape conceals thousands of caverns, many of which are open for tourists. Given the age of our kids, we decided to visit the Fantastic Caverns, which is America’s only ride through cavern. We learned about the history of the cavern, conservation, and experienced complete darkness. Following the tour, we were happy the kids found affordable souvenirs in the gift shop ($2-10 each). there’s always something fun about visiting the original. We enjoy donuts for breakfast on Saturday mornings, but these are better served as dessert. At Hurts Donut Company, you’ll find a wide assortment of cake donuts slathered in delectible frosting and sprinkled with everything from familiar candies to cookies. We had a great time in Springfield, and look forward to returning when we can enjoy the great outdoors! If you ever pass through Springfield, or stop for a while, maybe you can visit one of our destinations. Last weekend we savored family time in Klyde Warren Park with my parents, sister, and brother-in-law. Despite being open only a few years, Klyde Warren Park proved itself an urban oasis. I was surprised to find a sea of lush green grass and tall shade trees surrounded by the world renowned Dallas skyline. Naturally we spent the majority of our time in the Children’s Park, but we also relaxed in the reading and games nook as the guys played a bit of frisbee in an open field. In the Park, the kids had a great time climbing the “spider webs”, exploring the tree house, creating music, and spinning on merry go rounds. As a mom of preschoolers, I was impressed with the cleanliness and ample size of the restrooms. 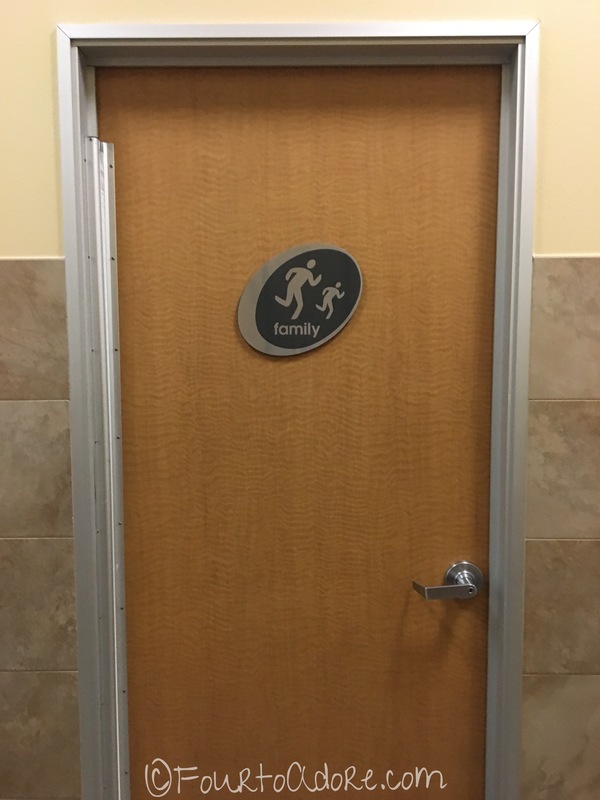 When the kids ask to use the restroom at a park, I cringe, but this one was on par with popular restaurants and shops. Because we had brunch plans, we only spent a few hours in the park, but there is much more to do- on another visit. For instance, the kids could splash in the fountains, visit the butterfly garden, wander the botanical gardens, participate in story time, or bring the dogs to the bark park. We could also nosh on food truck delights. If George would agree to watch the kids for a bit, I might enjoy a little yoga in the park too. There are plenty of free things to occupy us for hours! As the weather began to heat up, and we worked up an appetite, we retreated to LARK on the Park for Sunday brunch. The chalk art and natural light in the restaurant were stunning, and the food was delicious. I later learned the chalk art is rotated quarterly based on artist submissions. We especially appreciated the #DallasStrong piece, honoring the five police officers tragically lost earlier in the month. Dallasites are proud, and I believe will continue working to make necessary change and heal. You can dine at LARK on the Park while artists create these stunning chalk drawings. If you live in the Dallas area, and haven’t been to Klyde Warren Park, I promise it’s worthwhile. If you live afar, but happen to visit the Big D, Klyde Warren Park is a Dallas must see attraction. This summer, I didn’t create an official summer bucket list, but we’ve had plenty of summer fun. We’ve enjoyed library story time each week, which includes stories and songs followed by a literature based craft. Last week, story time was cancelled for Big Vehicle Day at the library. Since there are typically about 20 kids at story time (with four being mine), I wasn’t expecting much from the event. I anticipated a slightly larger crowd than the regulars, and a parking lot with perhaps a garbage truck, school bus, and a construction vehicle. I grossly underestimated the library! Big Vehicle Day was quite an event. Upon or arrival, I instantly regretted not making the kids dress alike as I spied a sea of preschoolers and their parents scattered around a lineup of vehicles. Since it was a sweltering hot Texas day, we did a quick stroll past each vehicle, and then each child choose one vehicle to explore further. We saw everything from mounted police to a street sweeper and an ambulance. 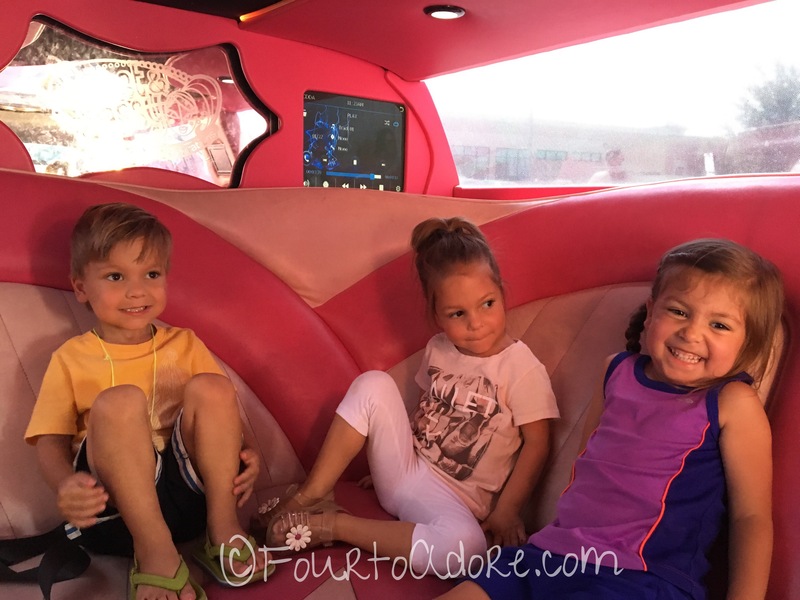 It was no surprise that the girls chose to check out the pink glitzy limo from a local children’s salon. 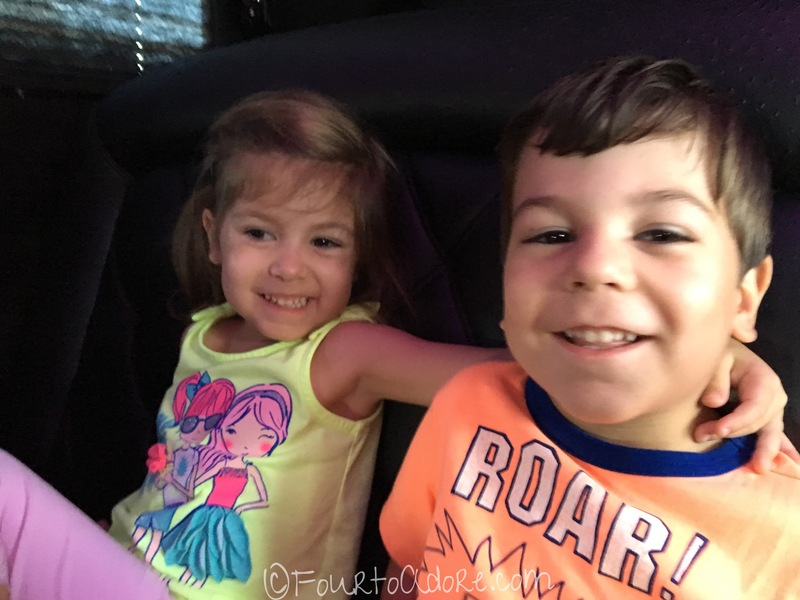 The kids had never seen a limo before and were thoroughly impressed with the sparkling interior lights and countless drink holders. Harper was underwhelmed, however. As we exited the limo, the girls had a shiny star painted on their cheeks and fairy glitter spritzed in their hair. The boys opted out of this sparkle treatment. 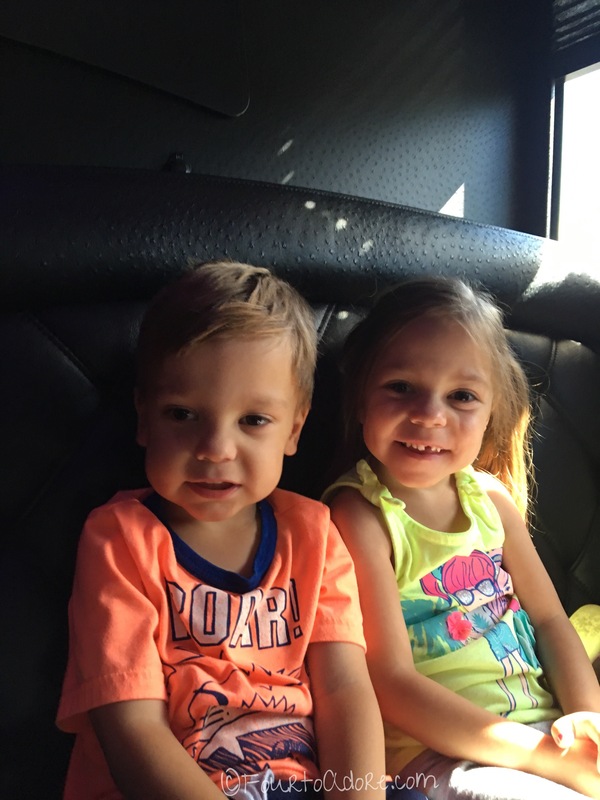 Mason chose to tour a recreational vehicle and Harper wanted to check out the wrecker. Since we couldn’t go inside the wrecker, Harper was allowed a second choice. 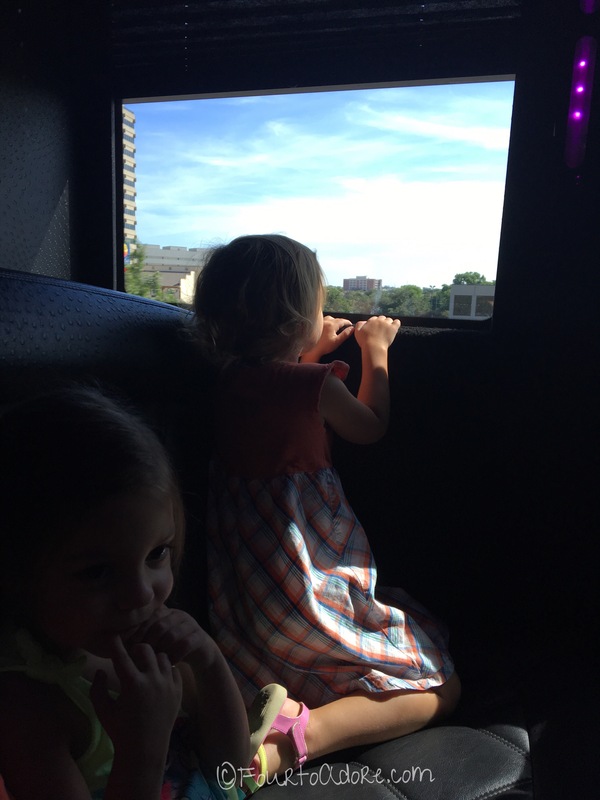 He quickly settled on the Dan Dipert tour bus, which turned out to be a lovely reprieve from the heat with its blasting air conditioner. Before heading home, I thought it was important for the kids to thank the police officers and see one of the squad cars. Much to my chagrin, the kids were totally uninterested in seeing any of the police vehicles, aside from the horses. Since my uncle is a fire chief, they’ve seen the inside of many fire rescue vehicles and have even used the radio in the chief’s car. I can only assume the police cars didn’t seem novel, that or it was just too hot. Sydney was the only one to go inside the squad car, but all four obliged me for a photo with one of the officers. Last summer I enrolled the girls in summer dance lessons, but it didn’t go as well as I hoped. Three of the kids regularly participated, but Rylin attended a single class (the first one) for the full length of time. Though I sat right outside the studio door, she developed extreme separation anxiety. As the weeks pressed on, I hoped it would improve, but it never did. When it was time to enroll in classes for the school year, I opted out, feeling defeated. I mulled it over and though I wasn’t hoping for a prima ballerina, I knew dance lessons (or something similar) would help Rylin develop a few essential skills. Since we are homeschooling it was important that she learned to follow directions from another adult and feel comfortable without me. Because Rylin associated the original studio with anxiety, I decided we should try again elsewhere. In fact, I thought the best place was in my Aunt Linda’s class. The first few weeks of dance at the new studio were difficult, but Linda had several wonderful techniques that effectively eliminated anxiety for Rylin. The first two lessons were a mommy and me class. All of the parents stayed in the studio and participated so the children could learn what to expect WITH their moms. She followed a very predictable routine in the same room each week. She never forced participation, but encouraged it. She used peers as models for new skills. She used lots of praise and encouragement. Rylin really enjoyed the mommy and me format, but when it ended, she was unhappy and distraught. I knew that if I attempted to stay in the room, it would exacerbate Rylin’s anxiety by inadvertently suggesting, “It’s not okay for you to do this without me.” When Rylin refused to attend class, Sydney went alone and was praised for her effort. Rylin was seated in a designated “boring chair” outside the studio. While in the boring chair, I did not interact with Rylin at all and did not allow her to play with toys or read books. After sitting in the “boring chair” once, Rylin started going to class and never threw another tantrum. In fact, she began excitedly anticipating dance class and always participated. Over the course of the year, both girls made gains in self confidence, following directions, and developing motor skills. Rylin began talking about going on stage and asking when it was time for recital. She was thrilled for her time to shine. The night prior to recital, both girls woke up at 3:00 am with terrible coughs. Needless to say, we didn’t sleep well and the girls awoke GROUCHY! Rehearsal was atrocious. Both girls were clingy and whiney. Rylin burst into tears at the thought of going on stage and there was no consoling her. Sydney agreed to dance with her class and Rylin enjoyed watching from the audience. After seeing her class perform, Rylin reconsidered her stance about joining them. To up the anty, George promised flowers and cookies to whoever danced on stage. Rylin excitedly accepted the challenge! 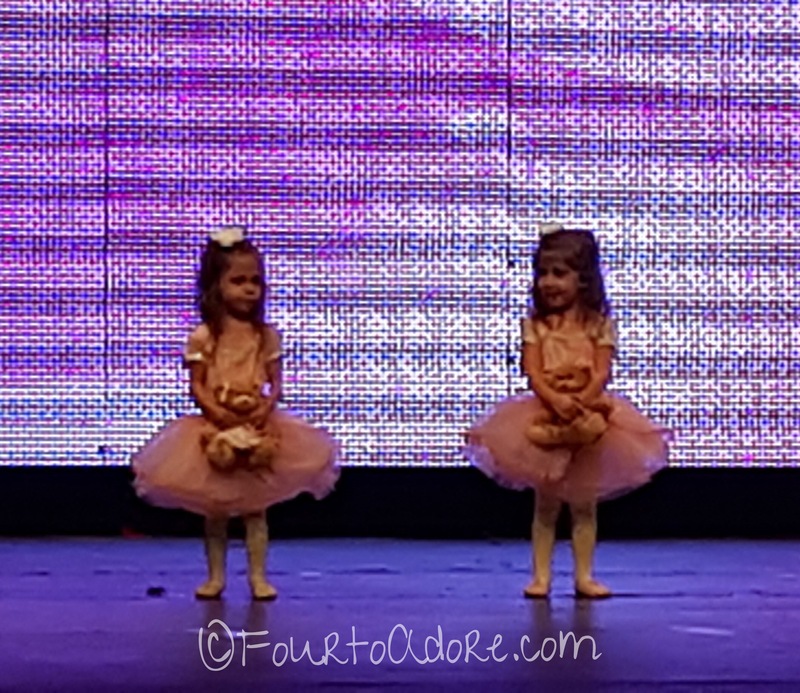 The pair enjoyed primping for recital and wearing their sparkly pink tutus. As it was time for me to go to the audience, Rylin began to tear up and cling to me. I was relieved when my cousin’s daughter appeared in the dressing room and began encouraging the girls. I felt confident leaving them with T and made my escape. The backstage moms later told me that T was a huge asset backstage and Rylin may not have danced without her. As the girls’ class entered the stage I held my breath as I counted silhouettes. 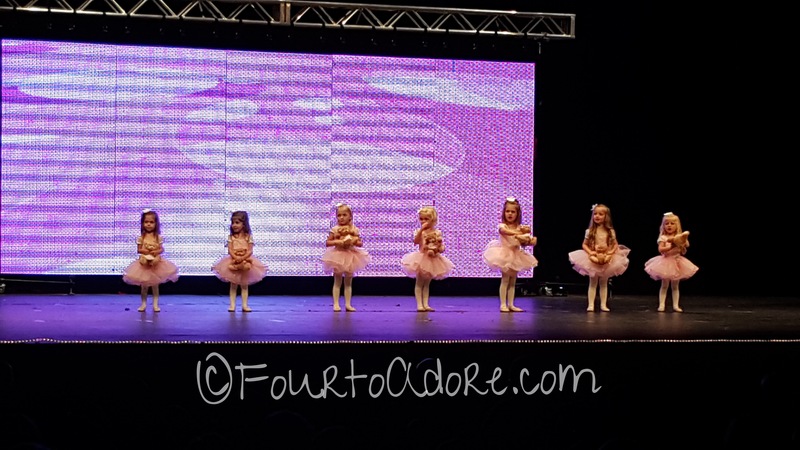 I sighed as I spied six dancers instead of seven, expecting that Rylin wasn’t going. As the lights came on, I nearly cried tears of joy as I both girls on stage and dancing together. 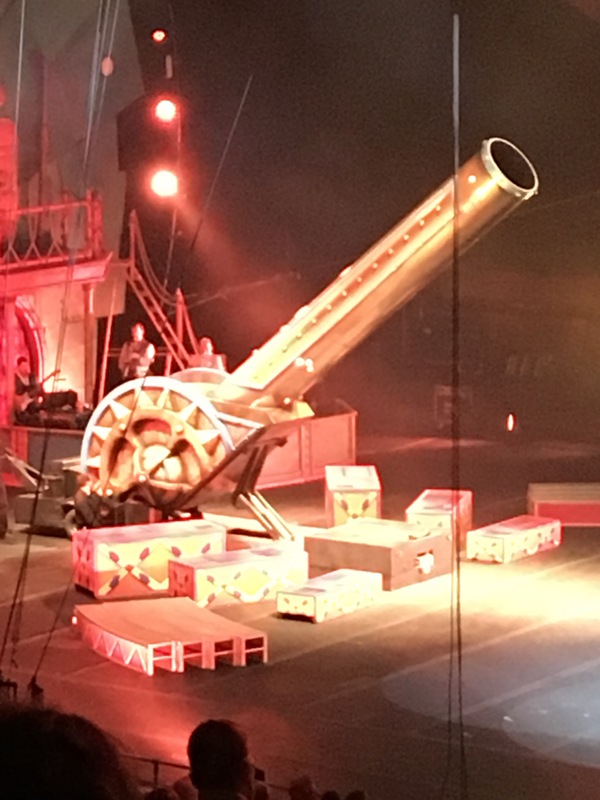 These babies have come such a long way from being two and three pound preemies to conquering their fears about performing. When reunited backstage, the girls beamed with pride and Rylin began asking when she could dance on stage again. It won’t be for another year, but we are signed up for dance again next year. The girls were delighted to see that Daddy delivered the flowers and cookies as promised. What fears have you conquered? I hate it when I don’t take my own advice with the kids, especially when it involves one of my “soapboxes”. This is one of those instances. Professionally, I receive numerous requests to consult with parents and teachers regarding behavior and academic problems in children. Over the past decade I’ve observed hundreds of classrooms in many different schools. I often find myself fidgeting while observing lengthy lectures in elementary classrooms and think to myself, “I can’t sit still this long, why are KIDS expected to do so?!? !” For behavior problems (e.g. off task behavior, verbal or physical aggression, fidgeting) I always recommend additional opportunities for sensory motor activity. I’ve advocated for hyperactive children to get additional recess, or at least extra opportunities to move during their day. When school staff uses removal of recess as a consequence I’ve encouraged them to at least consider what I dubbed “alternative recess” where the child is not permitted to use the playground, but instead can exercise, run laps, walk the perimeter of the playground, etc. to avoid making them sit still. When teachers are told they cannot provide more than 15 minutes of recess per day, but struggle with behavior problems, I encourage them to sneak physical activity into their lessons. Some teachers take breaks between lesson and lead in classroom exercises while others take the class outdoors for lessons. In order for children to be ready and able to attend and follow directions, they require adequate physical activity. This year I cringed as I overheard a kindergarten teacher announce “You won’t get recess tomorrow if you are hyper like this again! You can’t handle recess.” and when another teacher opted for indoor recess because it was “too cold” (it was about 50 degrees and sunny). Kids are not equipped to remain still and quiet indoors for long periods of time, and there are ramifications when adults expect it. During the heat of the summer, I took the kids for walks around the neighborhood and we played in the front or back yard at least once per day if not more. If it was miserably hot, we used water to keep things comfortable, or ate cold snacks like watermelon and popsicles. Sometime around October I mentally thought it was too late in the season to do water play and put all the water toys away, but it was still HOT here. There was less daylight at that time too and the rain came. It must’ve been about that time of year that we stopped playing outside daily. We got into a rut of indoor play and being quite lazy. When the holidays came, we over indulged in television. No surprise, the kids weren’t napping well and were often cranky. DUH! They didn’t get adequate physical activity and outdoor play. Since having that “ah-ha” moment, I’ve made a conscious effort to take the kids outside to play at least once, if not twice daily. If it’s cold or damp, we dress for the weather and find few legitimate excuses to stay inside. The kids typically balk and fuss about going outside, but once they start playing they forget they wanted to stay indoors then fuss when playtime ends. Outside, the kids have noticed shapes in the clouds, experienced static electricity, and “cooked” meals using garden harvests. Sasha has enjoyed sunbathing again and the chicks found plenty of bugs to nosh. Our play equipment has been enjoyed again. The American Heart Association recommends that children two and older get at least 60 minutes of moderate physical activity daily. One of the major reasons we moved from our old house was for a yard with ample space for play equipment, a garden, kids to run freely, and to house backyard chickens. We’ve invested quite a bit in the yard to make it a sanctuary for our family and it must be used every single day. Since getting back outdoors, the kid’s behavior has improved. They sleep better, are in better moods, are using their imaginations, and are learning. I’m reaping these benefits and so are the furry and feathered members of our family. Outdoor time serves us well! 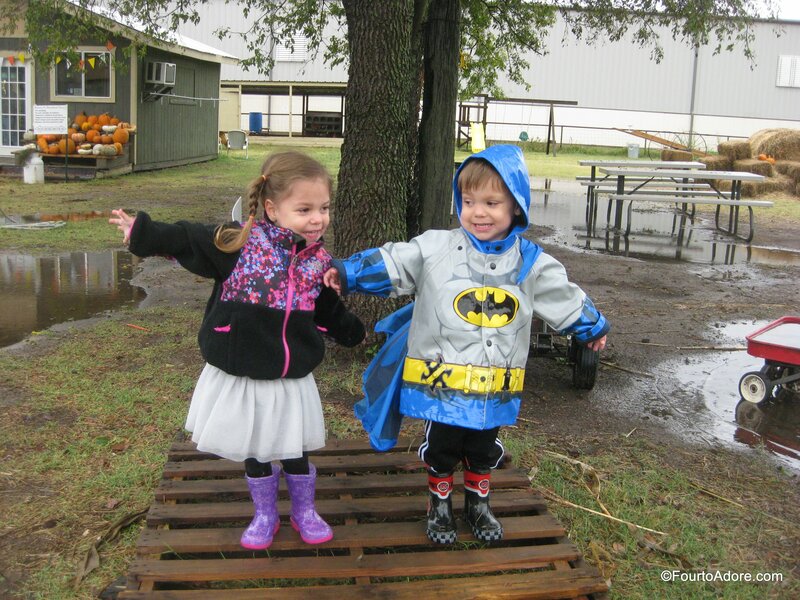 Sometimes it takes a little effort to get kids dressed for outdoor play, but it’s always worthwhile. Want kids to listen more, fidget less? Try more recess. This school did. 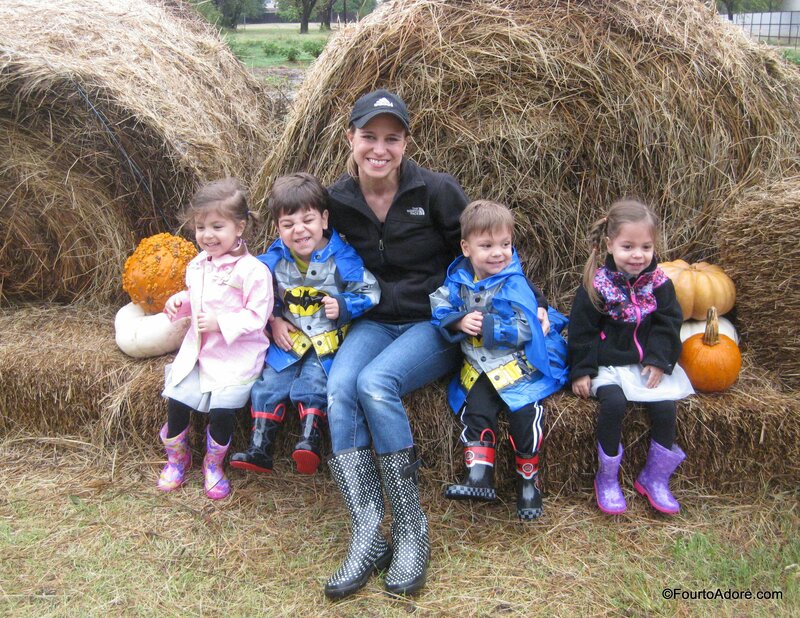 Last year, the quads visited a pumpkin patch for the first time, and I knew it should become a family tradition. There’s something about taking a hayride on a crisp day and the sight of bright orange pumpkins littering an open field that signals onset of autumn. However, here in Texas most October days felt like summer with temperatures in the 80-90’s. This summery weather stifled our autumn spirit. 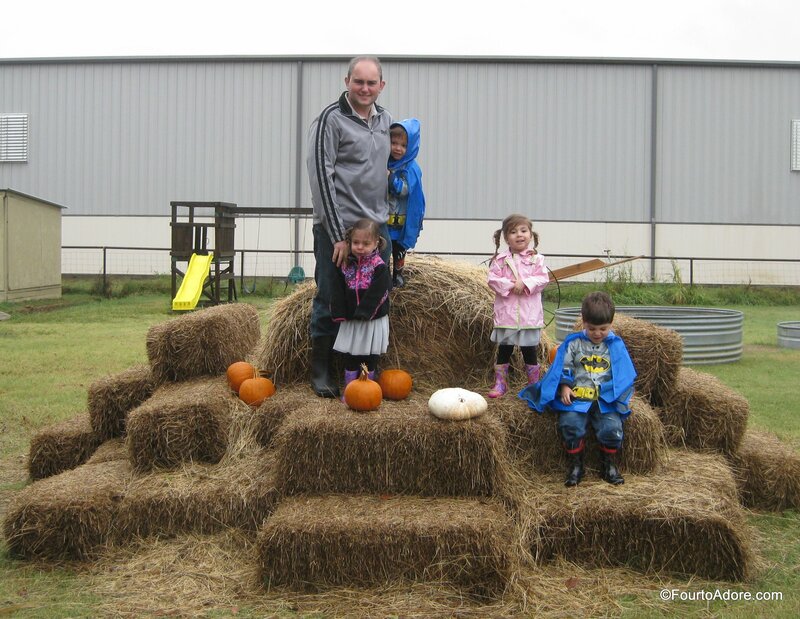 When this weekend promised a cool front, we promised four little people a trip to the pumpkin patch. Unfortunately, the cool front was accompanied by torrential rain, which did not bode well for our plans. After our local meteorologist promised a slight reprieve in the afternoon, George and I knew we needed to keep good on our promise. Anticipating plenty of mud, we took the kids to Payless Shoes to score some new kicks appropriate for mud. They were trilled at finding rain boots clad beloved characters: Minnie Mouse, Spiderman, Anna & Elsa, and Lightning McQueen. 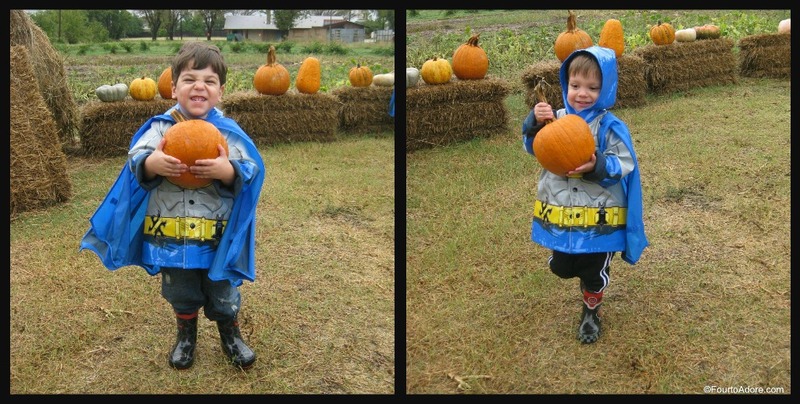 The boys were equally ecstatic we had an occasion for them to wear batman rain coats. 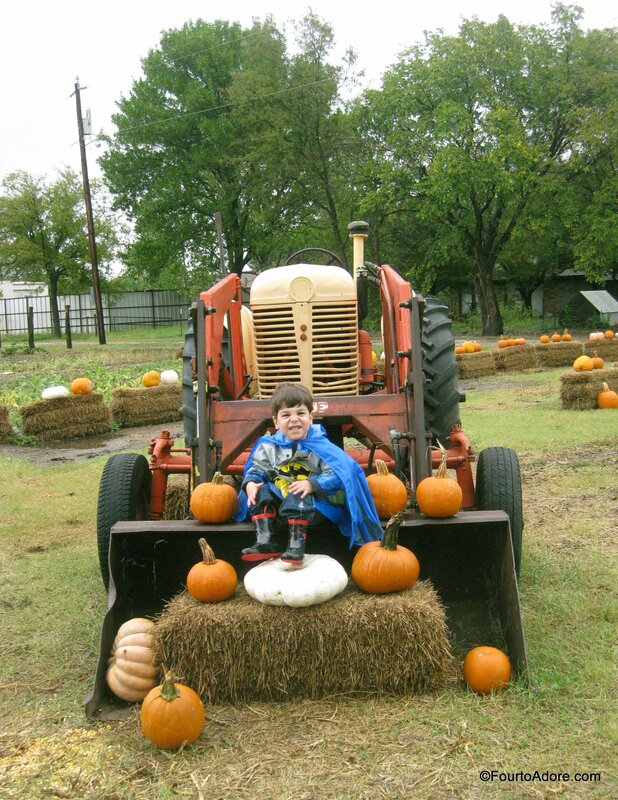 The boys proudly hauled their pumpkins into the farm-house for purchase. These pumpkins will decorate or porch for Halloween, and then will be roasted for spiced pumpkin soup next month. 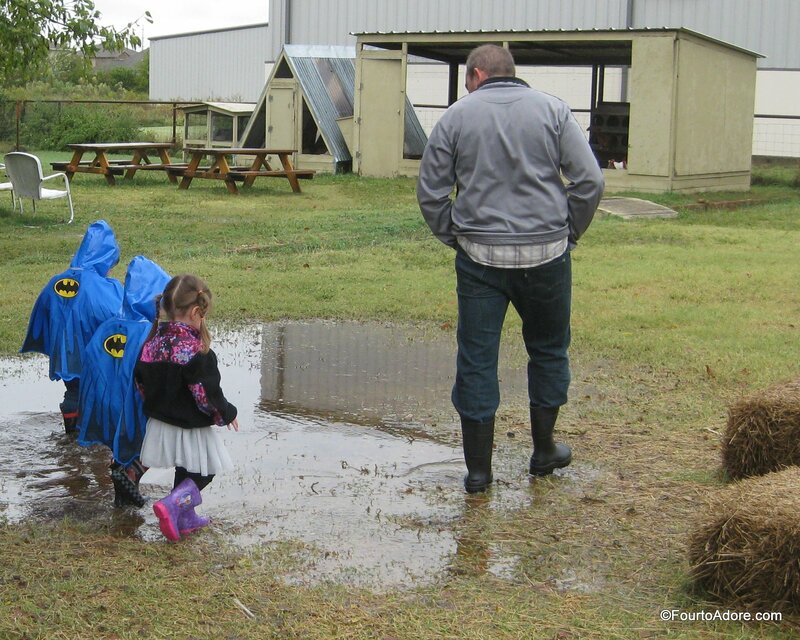 The kid’s rain boots proved worth every penny we spent on them. 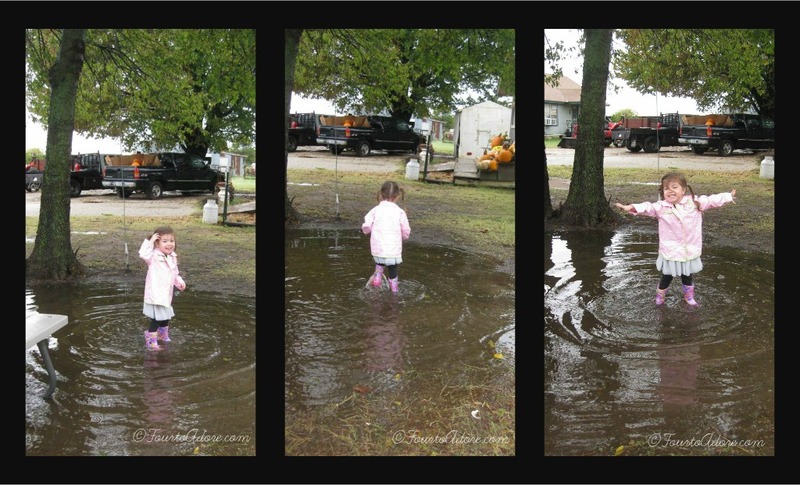 Rylin happily twirled, hopped, and splashed about an enormous puddle. 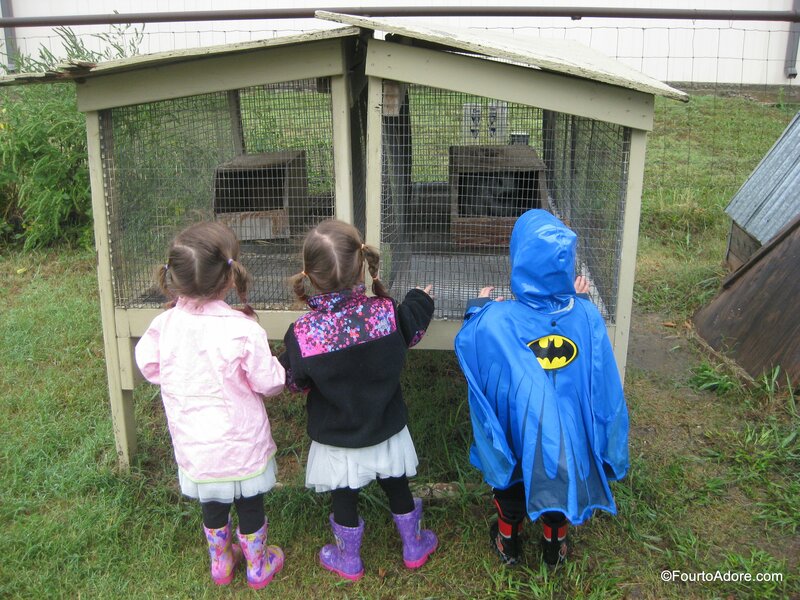 Though many of the typical farm activities weren’t open due to the weather, the kids enjoyed visiting the rabbit, chickens, and farm dog. They also experienced a see saw for the first time. Unfortunately, see saws are quite dangerous and required close supervision, hence, not photos. Sorry, folks! Things don’t always go as we originally envision, but when we embrace life, they can be better than we imagined. I’m glad we didn’t let a little rain and mud spoil our plans because we made the best kind of memories in the moment. P.S. You can also find us on Facebook, Twitter, and Pinterest!